Emerging from the Washington DC metal underground, Iris Divine may be on the cusp of getting some significant recognition. The band releases their first full-length album, Karma Divine on Sensory Records, a division of Laser's Edge. 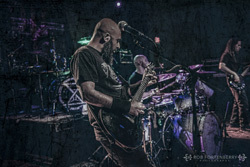 The band is a three piece offering a slightly modern spin on progressive metal. My first observation when listening to the album is that these dudes are talented and creative musicians. The weld their instruments like craftsman drawing out rhythms, tones, and arrangements that immediately suggest your interest. A second observation may be that this is a guitar-oriented progressive metal. Navid Rashid riffs are abundant being chunky, sharp and moderately d-tuned. His leads, when found, are conjured more from intricacy and subtlety than trying to be some Malmsteem, or other, maestro. His chord structure and progression seem much more important. Also the vocalist, Rashid has moderate voice, singing clean for the most part. On Apathy Rains he gets a bit screamo. Both underneath and swelling around the guitar, the rhythm section offers both groove and intrigue. Drummer Kris Combs seems to have an easy style, both leading the pace but offering moments of flair. Brian Dobbs's bass playing is sturdy and heavy, but there a times he sounds like an escapee from a jazz fusion band, like within the latter third of A Suicide Divine or In Spirals. Then to mention some songs. Thanks to their sense of melody and groove, a sense of accessibility, the intrigue, or complexity, of their progressive metal is all that daunting. Most songs pull you right in and simply ask you to listen, contemplate, and hang the hell on. I'll admit I favored the songs were the melody was more prominent or catchy as with Fire of the Unknown or A Suicide Aware. Other songs, like Apathy Rains and Prisms, where the heaviness stomps on the melody, not so much. But they're still intriguing tunes. Possibly, my favorite song was In Spirals. Nearly entirely instrumental, every instrument gets due vibrant and significant, notably the bass line. One thing I didn't like about the song, and it's elsewhere in the album, was all the spoke word hooptedoodle. A little is fine, but not on so many songs. Otherwise, Iris Divine's Karma Sown is a rather striking and entertaining album of progressive metal from three talented musicians. Recommended. 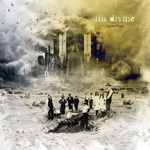 Iris Divine's Karma Sown is a rather striking and entertaining album of progressive metal from three talented musicians. Recommended.